Accident—Multiplier—Variation in age of deceased as mentioned in various documents on record—Age which would be more beneficial to the heirs of the deceased should be taken as the M.V. Act, 1988 has been enacted as a beneficial piece of legislation for the welfare of third parties involved in accident. Comments Off on Accident—Multiplier—Variation in age of deceased as mentioned in various documents on record—Age which would be more beneficial to the heirs of the deceased should be taken as the M.V. Act, 1988 has been enacted as a beneficial piece of legislation for the welfare of third parties involved in accident. Accident—Love of Affection—Even the father would be entitled to be compensated on account of loss of love and affection, even though he was not dependent on the deceased.Accident—Multiplier—Multiplier has to be assessed by keeping in view the age of deceased and not age of claimant as held in Munna Lai Jain’s case. Comments Off on Accident—Love of Affection—Even the father would be entitled to be compensated on account of loss of love and affection, even though he was not dependent on the deceased.Accident—Multiplier—Multiplier has to be assessed by keeping in view the age of deceased and not age of claimant as held in Munna Lai Jain’s case. 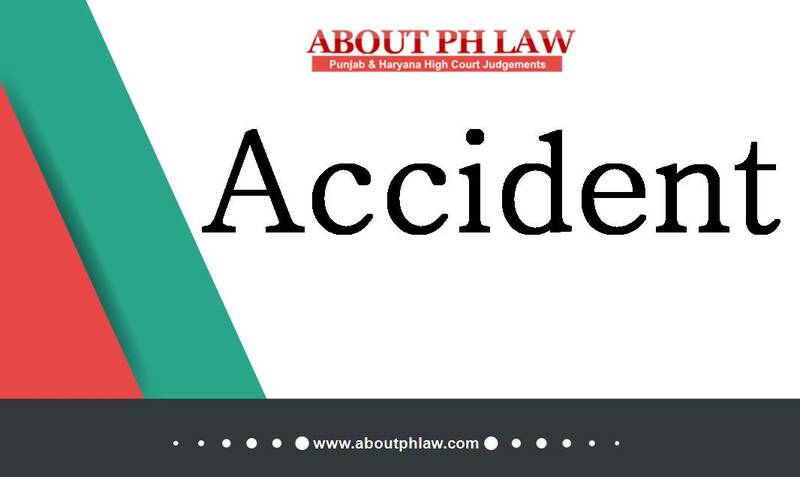 Accident–Multiplier–That for the person of the age of 50, who had not reached the age of 51, the multiplier applicable is of the age group of 46 to 50 and not of 51 to 55, as such, the Tribunal has wrongly applied multiplier of 10 while calculating amount of dependency-Multiplier applicable to age group of 45 to 50 is 13. Comments Off on Accident–Multiplier–That for the person of the age of 50, who had not reached the age of 51, the multiplier applicable is of the age group of 46 to 50 and not of 51 to 55, as such, the Tribunal has wrongly applied multiplier of 10 while calculating amount of dependency-Multiplier applicable to age group of 45 to 50 is 13. Motor Vehicles Act, 1988, S.166-Accident-Claimant-Minor brother of deceased cannot be held to be dependent on deceased—Widow of deceased who had remarried is also not entitled to compensation. Comments Off on Motor Vehicles Act, 1988, S.166-Accident-Claimant-Minor brother of deceased cannot be held to be dependent on deceased—Widow of deceased who had remarried is also not entitled to compensation. Motor Vehicles Act, 1988, S.166–Accident–MuItiplier– It has to be according to age of claimants and not the deceased. Comments Off on Motor Vehicles Act, 1988, S.166–Accident–MuItiplier– It has to be according to age of claimants and not the deceased. Accident—Amount towards loss of supervision by owner should be added in annual income of deceased before applying the multiplier. Comments Off on Accident—Amount towards loss of supervision by owner should be added in annual income of deceased before applying the multiplier. Accident—Liability to pay compensation, other than the driver of the vehicle, would fall upon the real owner of the vehicle, whether or not he was the registered owner thereof. Comments Off on Accident—Liability to pay compensation, other than the driver of the vehicle, would fall upon the real owner of the vehicle, whether or not he was the registered owner thereof. Accident—Multiplier—Deceased was to be in service for further four years-­Multiplier of 9 was to be applied for a period of four years and thereafter, the multiplier of 7 should have been applied on pension. Comments Off on Accident—Multiplier—Deceased was to be in service for further four years-­Multiplier of 9 was to be applied for a period of four years and thereafter, the multiplier of 7 should have been applied on pension. Accident—No fault liability—The correct method to assess the income of a deceased, would be in terms of the notified wages applicable on the date of the accident. Comments Off on Accident—No fault liability—The correct method to assess the income of a deceased, would be in terms of the notified wages applicable on the date of the accident. Motor Vehicles Act, 1988 S.166-Accident — Just compensation—Deceased was aged 41 years and earning Rs.5360/- p.m. Comments Off on Motor Vehicles Act, 1988 S.166-Accident — Just compensation—Deceased was aged 41 years and earning Rs.5360/- p.m.
Accident—Multiplier—Future Income—The multiplier to be applied on the loss of dependency on prospective income, would be as is applicable as per the actual age of the person who dies in a motor accident. Comments Off on Accident—Multiplier—Future Income—The multiplier to be applied on the loss of dependency on prospective income, would be as is applicable as per the actual age of the person who dies in a motor accident. Accident—Income—Injured aged 5 years—Notional income taken at Rs. 6OOO/ – p.m. at par with minimum wages of unskilled labour; held to be justified. Comments Off on Accident—Income—Injured aged 5 years—Notional income taken at Rs. 6OOO/ – p.m. at par with minimum wages of unskilled labour; held to be justified.